At the end of October I attended the Cisco Collaboration Summit 2013. It was my fourth conference of the month, followed by November commitments, so my backlog prevented me from writing sooner. This was an important event, but not because of any announcements (there were few). It was important because it was a debut of sorts of the new Collaboration leadership team headed by Rowan Trollope. Rowan’s boss, Marthin De Beer, was also at the event, but it was Rowan’s show. Rowan replaced OJ Winge a few months after his departure from Cisco. Rowan was named the head of Cisco Collaboration in November 2012 had previously headed up Symantec’s cloud business unit. Turning a Cisco size ship is a gradual process. He was named just less than a year prior to the Summit. Not enough time to demonstrate significant changes other than vision and make team changes, so that was the focus of the event. The Summit represented an interesting challenge for Cisco. Rowan was too new to have made a significant dent to the portfolio. No doubt, there are huge transitions in development, but no one likes it when products get pre-announced way before availability (like Polycom does). So instead, the event was filled with visionary generalities. The Cisco Collaboration experience should be “delightful.” “We are at war with good enough.” The solutions must become “simpler.” Rowan promised significant changes with the line “you haven’t seen nothing yet” (as if we hadn’t noticed). Yet, there were some significant changes. The team was more concerned about the end user experience before. The leadership team was almost apologetic, and humble. They stressed the notions of simplicity and “delightful” experiences. This is the way our industry is shifting – BYOD, app stores, cloud services are all empowering the end user. The key themes I kept hearing were: simplification, cool as consumer apps, hybrid, cloud, mobile, and experience. I was actually expecting a lot of Lync bashing, but I was wrong. In fact, Lync only came up when analysts asked questions about it. I think Lync represents a bigger threat to Cisco than any other UC vendor. Partly because unlike the other UC vendors that offer a best of breed value proposition, Lync competes with Cisco’s value proposition. Cisco became the leader in UC with a comprehensive solution. As an incumbent, Cisco benefited hugely as the decision maker transitioned from telecom to IT. Cisco was the safe bet that tied everything together. The rest of the industry has to justify their existence and often introduce themselves for the first time to the CIO. Cisco was already in IT as were its certifications and champions. It played together with existing infrastructure (albeit theirs). It also tied into Microsoft Office, and it was the current title holder of the “nobody ever got fired for buying…” line. The best of breed players have their competitive strengths, but have to work much harder to get heard. Microsoft Lync is an incumbent with certifications and champions. It also plays well with Office and existing infrastructure (albeit its own). It also has the ability to subsidize aspects of its solutions, and it also has part claim to the nobody gets fired line. For the first time in Cisco’s UCC history, it has to compete against a similar value proposition. For Rowan to be successful, he has to pull some rabbits out of his hat. I think we are going to see Cisco get into UCaaS directly –more on that separately. He also has to turn up the innovation engine. 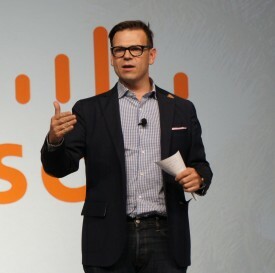 I’m actually feeling better about Cisco, and expect some big announcements in 2014. Cisco was much more honest. They only thing I felt they were fooling themselves about is the 6000 is suitable for SMB. Otherwise, I liked what I heard about vision and believe that Rowan will be successful in many areas in many ways. He seems to have energized his direct reports, at least the ones he kept. Prior rock stars Laurant and Murali were notably missing at the Summit. Since then, Laurant has moved to Avaya as VP Corporate Strategy and Development.